BinaryOptionsNow – Some of the biggest increasing online trading segments at the moment are binary options and financial spread betting. Many people confuse these two online trading types due to the fact that they are very similar to each other. Still, despite all similarities, these two online betting forms work completely differently. We’ve written an article that will describe all the aspects of binary options betting and financial spread betting. Both of these betting forms have a huge return of investment potential, but it’s only advised to try them out after one has fully understood their concepts. Binary options are a form of investing that involves the prediction of the development of share prices, commodities, financial assets or more. Binary options do not involve the purchasing of stocks, goods or commodities. It’s simply the betting on the possible outcome of a scenario during a given time frame. A binary option has two possible outcomes depending if the market goes up or if it goes down. The trader’s task is to select one of the possible outcomes and decide the amount of money that he or she intends to bet on the chosen option. If the trader’s prediction is accurate, then he or she will be paid out the bet amount plus the promised payout percentage. Most binary options are only open for a few minutes, meaning that the trader will never have to wait too long until a new, and possibly more profitable option appears. 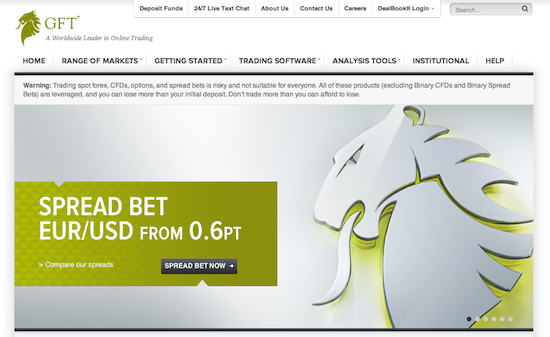 The winnings in binary options can be decided in advance. This is due to the fact that each option has a fixed return rate. The usual return rates are at around 65%-85%, but return rates of over 200% and even 400% are not uncommon either. Financial spread betting is in concept very similar to binary options trading, but the two differ in many aspects. In financial spread betting, the trader will also bet on the possible outcome or development of a stock, commodity or financial asset, but the profits or potential losses cannot be calculated in advance. A spread betting offer will contain the current price of a given asset, as well as the “sell” price and the “buy” price. Traders will have to decide which route to take and how much they intend to bet on any point increase or decrease of the given betting option. Imagine that Apple’s stocks are at the moment at a price of 585. In this case, a financial spread betting provider might quote the trader with the following bet: Buy: 586 / Sell: 584. In this case, the trader will have to decide to either go with buy or sell and the bet amount he or she wishes to use. If “buy” and a bet amount of $10 was chosen and during a certain time frame the stock prices have increased to 600, then the trader will win a sum of $140. If, on the other hand, “sell” would have been selected, then the trader would have lost $140. Basically, spread betting is different from binary options in the sense that potential winnings and losses cannot be predicted with accuracy in advance. The end win or loss will be calculated based on the actual increase or decrease of the market, not just the outcome. Also, spread betting is a step closer to classic financial trading than binary options are. 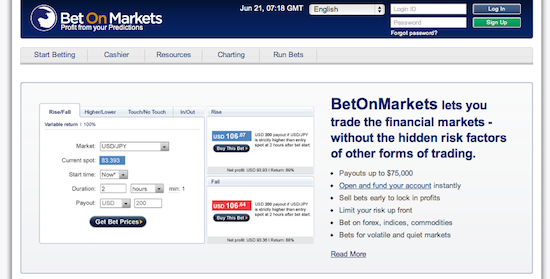 The majority of online trading providers offer both types of online speculating. Both binary options and spread betting are rapidly becoming very popular and thus a very large number of online brokers have decided to offer these services. One of these companies is GFT that mostly focuses on the UK online trading market. The reason for this is because spread betting and to a lesser extend binary options betting are very popular in the country. Yet another online trader that provides these trading possibilities is BetOnMarkets which is licensed in the UK and other European countries. Despite the fact that these two markets are relatively new, they are already regulated in a variety of countries and jurisdictions. For example, one of the most famous and well-known binary options regulatory jurisdictions is Cyprus which maintains its regulatory work through the Cyprus Security and Exchange Commission. Financial spread betting is also regulated by a number of jurisdictions such as the Gibraltar Gaming Commission. Regulated spread betting providers and regulated binary brokers are companies that are legally approved to offer these kinds of trading options.